In my searches for traditional rebozos and jewelry in Mexico I couldn't help but admire some of the contemporary work that I found there. I decided to create a new page for new pieces that excite me. 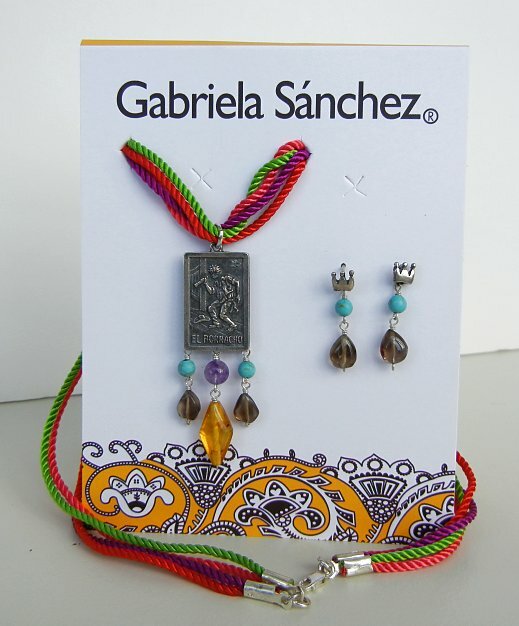 BELOW IS A GROUP OF PIECES created by GABRIELA SANCHEZ of GUADALAJARA, MEXICO. 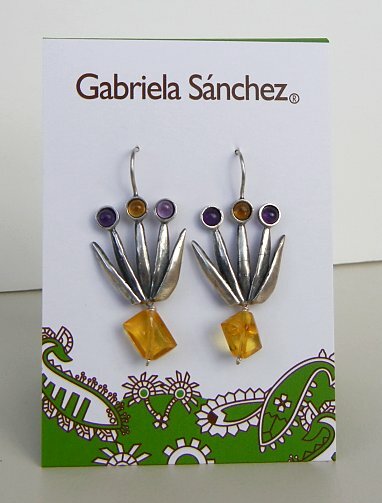 I was very happy to meet Gabriela Sanchez on my last trip to Mexico, talk with her about the inspirations for her jewelry, feel her impossible energy, and take in the beam of her constant smiles. Her work is inspired by Mexican cultural history which she re-interprets and carries into today's world. 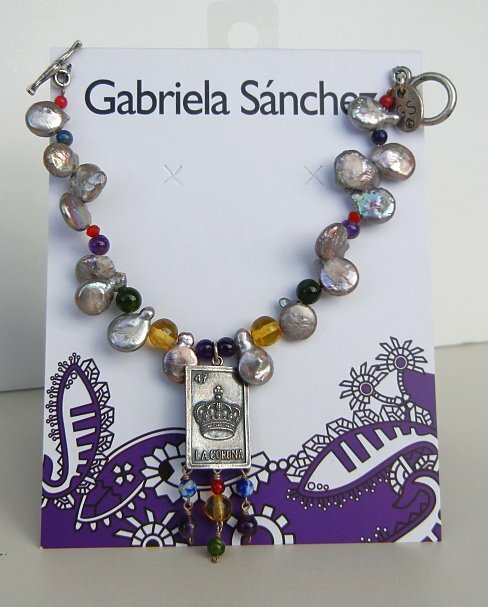 Every piece is different with an unpredictable and eclectic variety of gemstones, amber and pearls, fascinating imagery, and all inspired by the events of her own life. 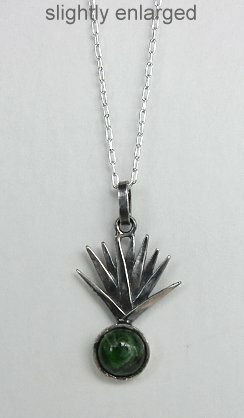 The work is excellent, the silver is sterling, and many of the pieces include her signature. 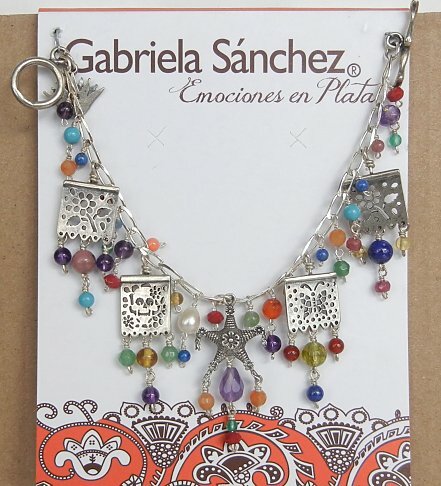 If you open the display card you will see a list inside of the names of the gemstones included in the pieces. Tu lo vas a sentir, tu lo vas a descubrir. Esta pieza tiene una energia especial para ti. This piece has a special energy just for you. NOW-005. What delicate little fish, bringing back memories of those in the waters of el lago de Patzcuaro. Patzcuaro Lake in the state of Michoacan. This would be beautiful either on an adult or a child. 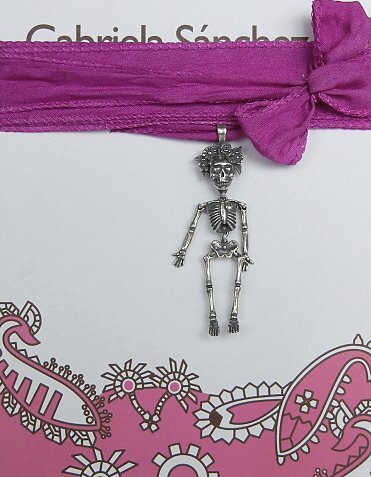 The pendant on the necklace (made up of narrow strips of suedine in pink and blue) is 1 1/2 inches long. 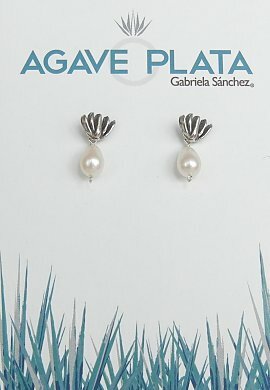 The stud earrings are each 7/8 inches long with the most delicate little fish. $45.US. NOW-006 This necklace of a combination of four colourful strands is 16 inches long. 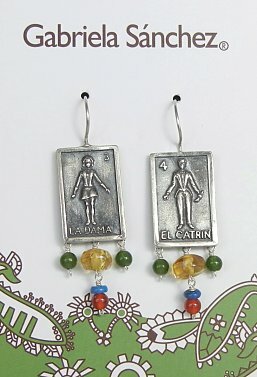 The typical and humorous loteria card of "el Borracho" (the Drunk) is the pendant card - 1 inch tall hung with gemstones and a nice lightly faceted amber bead from the Gulf of Mexico. 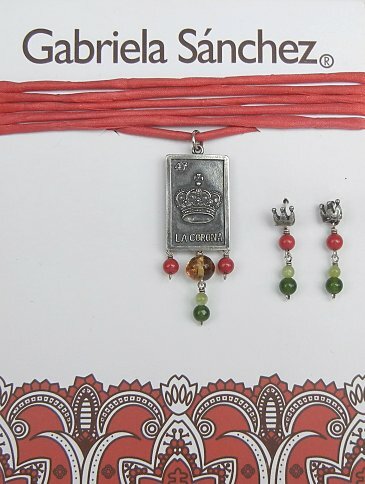 The stud earrings are topped with tiny little crowns. 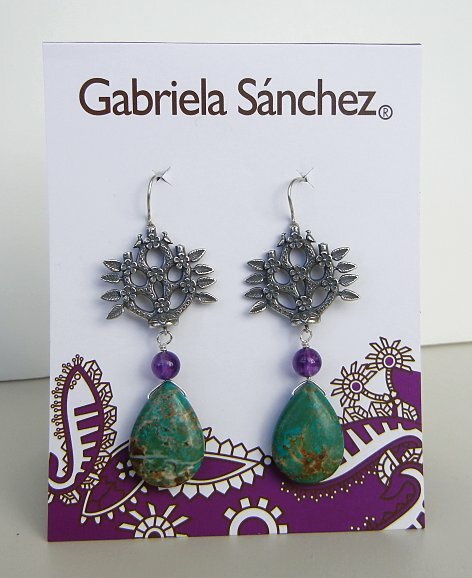 They measure 1 1/8 inches tall and feature turquoise and amethyst. $68.US. NOW-010. 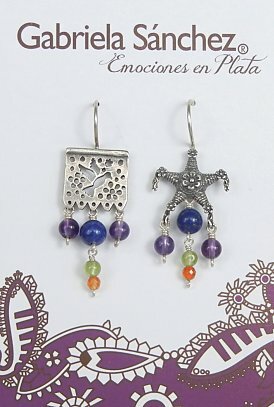 What marvellous earrings! Although thoroughly Mexican they did make me think of the song "Closing Time" by Montrealer Leonard Cohen. In the video you can see chairs slowly tumbling through the air above Cohen's head in the Toronto bar that he sang about. The chairs are impeccably made and decorated with floral designs on seat and back. 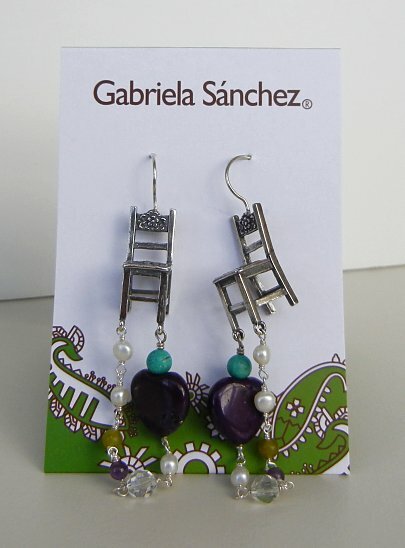 They are an inch tall, and when measured from the top of the ear hoop to the bottom of the gemstone & pearl dangles they are 3 3/8 inches tall. What a wonder they are! $125.US. NOW-018. 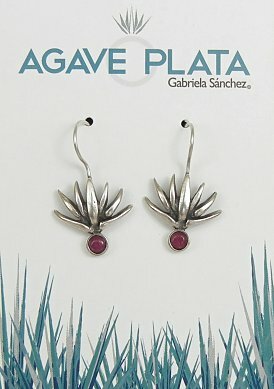 Here is a pair of agave earrings. Blue agave is used for making tequila and mezcal. 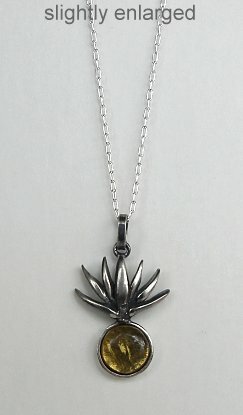 Agave is also used for a sugary nectar, and branches are roasted to eat. The flowers are edible too. At the same time, they are admired for their beauty and their decorative nature on the landscape. 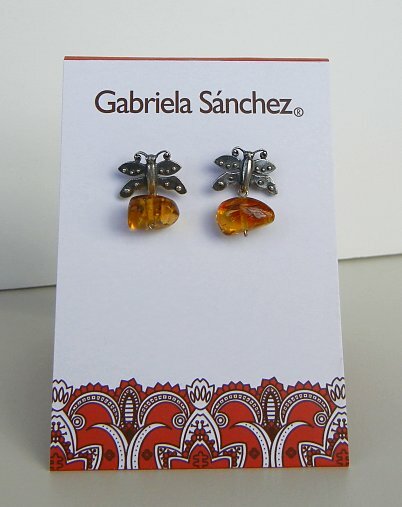 These earrings are 2 inches tall and have diamonds of amber hanging from them. $75.US. NOW-020. This is the only pair of cuff links that I have. 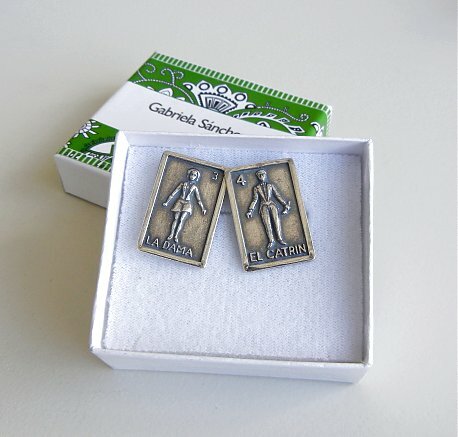 The loteria cards are "la Dama" (the woman) and "el Catrin" (the man who is a bit of a dandy. 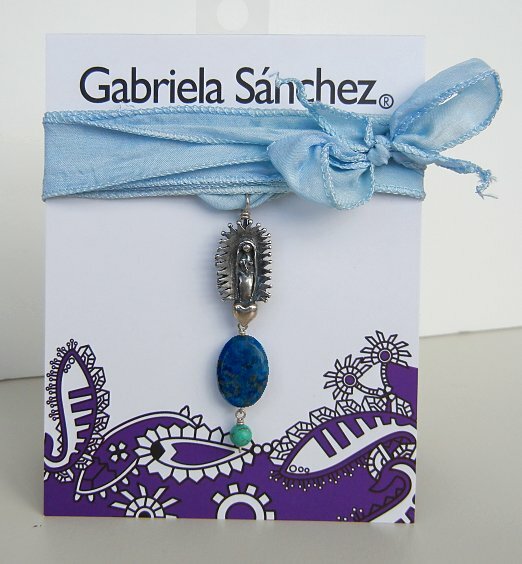 The loteria cards are 1 inch tall and are backed with a curve of silver and a back part to lock them into the buttonholes. They would be rather wonderful for an engagement party I think - with my sense of humour engaged. $105.US. NOW-021. 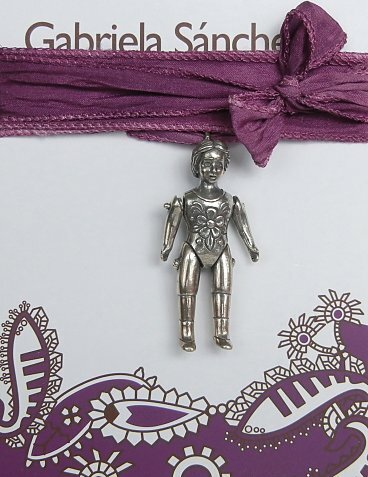 What a playful silver ring - Gabriela has a sense of the importance of games and toys in our lives. They are not to be left behind but still enjoyed in this all too serious world. The rocking horse is perfectly made with every detail and stands 5/8 inch tall. It looks real from all directions. The entire ring is 1 1/2 inches tall and a size 6.5. $95.US. NOW-022. 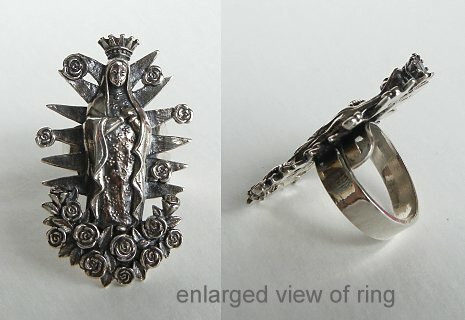 Here is a ring of the Virgin of Guadalupe, the famous saint of Mexico. Her shrine is the most visited place for Catholic pilgrims in all of the world. Guadalupe is standing on a heart and surrounded by rhodocrosite cabochons. 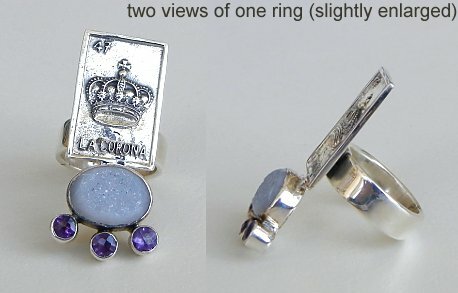 The image on the front is 1 1/5 inches tall and the ring is a size 6. 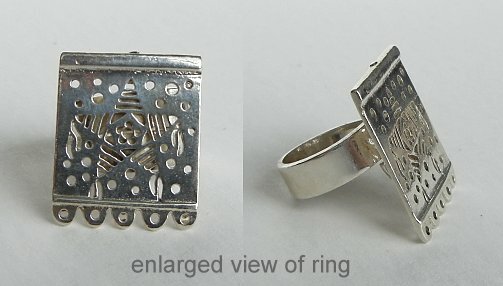 The ring is made so that it can be pulled larger to a size 6.5 or 7. $120.US. NOW-023. I was amazed when I saw the rings that Gabriela Sanchez created - such exuberant, energetic, and colourful pieces absolutely full of ideas. 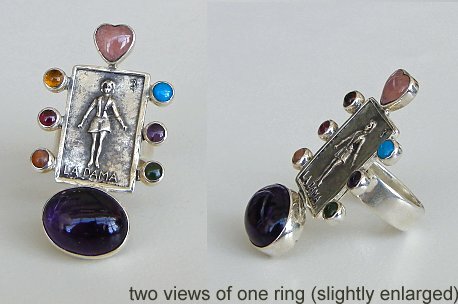 This ring has a loteria card of "la Dama" (the woman) with a pink gemstone heart above her head. Around her is a variety of colours of gemstones. Below is an oval of rich purple amethyst. The top measures 1 7/8 inches long and the ring size is 6.5. The ring is made to adjust so that it can be pulled to be a little larger - a size 7 or 7.5. $160.US. NOW-026. 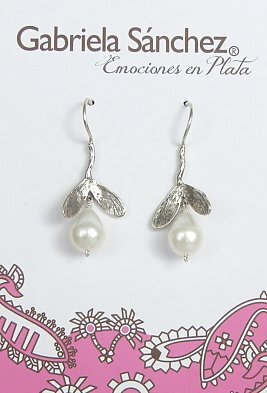 These are delicate and tiny silver and pearl post earrings - blossoms ready to open. They are 5/8 inch tall. $48.US. NOW-028. 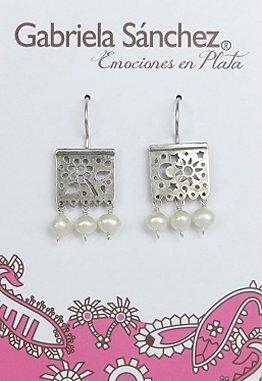 These pearl earrings are 1 5/8 inches tall. Very sweet. $60.US. NOW-029. More from the garden. 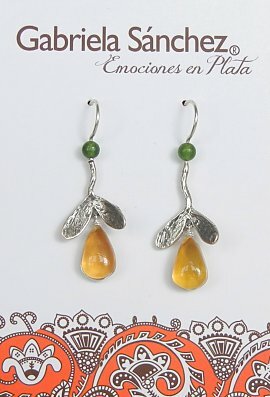 These earrings are 1 3/4 inches tall, include amber and a gemstone. $68.US. NOW-031. 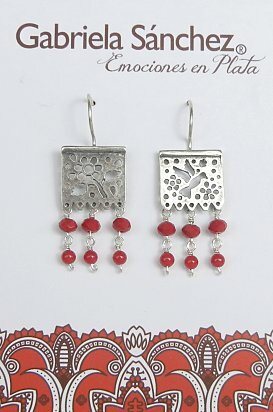 These gemstone earrings are a portrayal of silver papel picado, one floral and one with a bird. They are 1 5/8 inches tall. $68.US. NOW-033. 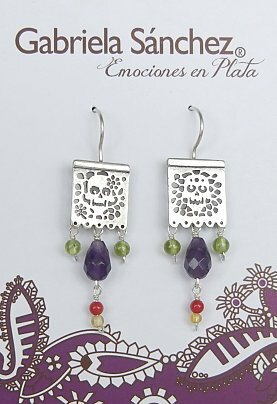 These gemstone earrings show one piece of papel picado with a bird, and a piñata. They measure 1 3/4 inches tall. $68.US. NOW-035. The triple papel picados (with gemstones) shimmer nicely when walking. They measure 2 5/8 inches tall. $125.US. NOW-036. 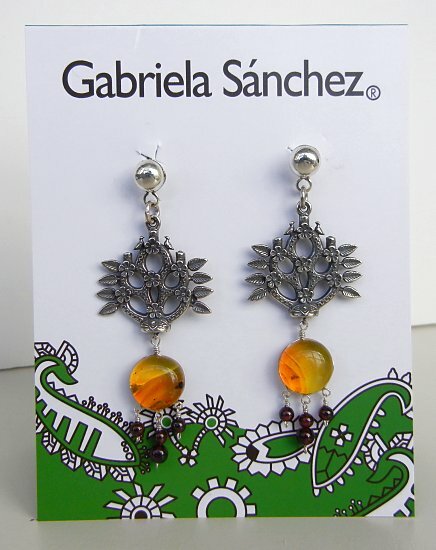 These earrings portray images from the popular Mexican board game called Loteria. La Dama and el Catrin. they are 2 1/4 inches tall. $95.US. NOW-038. I wonder if this is a humorous statement with a devil on the necklace and shoes for the earrings. Did the devil/el diablo make you buy them? The devil is on a satin cord but could be hung on a chain. 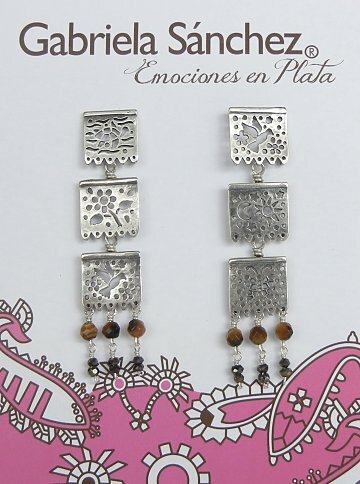 The earrings are on posts. $110.US. NOW-043. 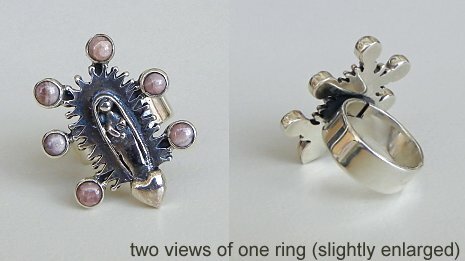 This silver papel picado ring is 3/4 by 7/8 inch in the front, is a size 6. it can be gently adusted a size or so in either direction. $85.US. NOW-044. 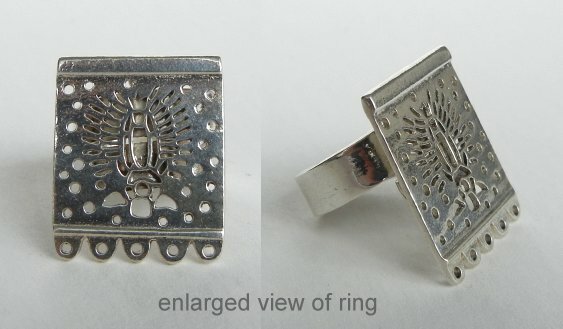 This Virgin of Guadalupe silver papel picado ring is 3/4 by 7/8 inch in the front, is a size 6. it can be gently adusted a size or so in either direction.$85.US.